Buy Clearspot Organic Plain Tofu - 280g in the UK from our online shop or directly from our independent Scottish store. ClearSpot Organic Tofu is lovingly made by hand in North Yorkshire to a traditional Japanese recipe. ClearSpot Organic Tofu is lovingly made by hand in North Yorkshire to a traditional Japanese recipe. Using only natural ingredients, they create a delicious tofu by hand blending and pressing 100% organic soya beans, water and nigari. Never knew what to do with seaweed? Try this healthy alternative to meat burgers, made with tofu and seaweed! Seasonal recipe with tomatoes and lettuce. This recipe contains 375g tofu. A simple recipe with seasonal cabbage and noodles. Serve with fried banana for a sweet twist. This recipe contains 2 packets tofu, cubed. Simple, tasty, healthy, vegetarian and vegan January recipe. The vegetables in this dish are in season from October until March! This recipe contains 1 packet plain tofu. We sell real Clearspot and other Meat Replacements directly from our shop in Scotland and online throughout the UK. View more products from Clearspot. Where can you buy real Tofu - Organic safely online? If you are wondering where you can buy Clearspot Organic Plain Tofu - 280g safely online in the UK, then shop with us. 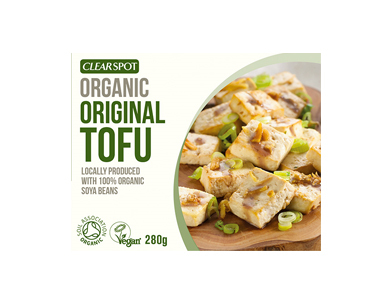 Tofu - Organic - Clearspot Organic Plain Tofu - 280g in Meat Replacements and Chilled Foods.